See Part 1, Beginner's Mind link and note - an early draft of ZMBM. Marian Derby Wisberg's account of the creation of Zen Mind, Beginner's Mind. Shambhala Publications link and Amazon link to the 40th anniversary issue of ZMBM. When Shunryu Suzuki first saw a published copy of Zen Mind, Beginner’s Mind, he looked it over for a minute and commented, "Good book, I didn't write it, but it looks like a good book." More than forty years before that, in the early twenties, as a young Zen monk strolling through the shops and stands in the bustling trade city of Yokohama, Suzuki had lamented the poor quality of Japanese furniture, toys, and other items bound for export. He wondered why they didn’t send abroad the best of their crafts and arts. Maybe someday, he thought, if he studied and applied himself sincerely, he could bring to the West what to him was truly the best his homeland had to offer, the way of his Zen mentors. He never completely let go of that idea, and eventually the knots of duty loosened, an opportunity arose, and he flew to San Francisco carrying a painting and a hidden plant. "as a young Zen monk strolling..." He talked about this in lectures. Will seek lecture source. In Crooked Cucumber I don't give sources for all the info and quotes, but almost all that material is available online - all the lectures are at shunryusuzuki.com and almost all the interviews are at cuke.com/interviews. I don't know if I'll ever get around to all that documentation. Like I remember a photo of Suzuki going to the plane to fly to America with a big flat package and I think it was someone like his sister or maybe his son, Hoitsu, who told me he snuck a plant in. Most of Suzuki’s students didn’t get too excited when Zen Mind, Beginner’s Mind came out. We had him and he told us to forget what he said in lectures and put our effort wholeheartedly into zazen and mindfulness. People did study, but his talks weren't thought of as being more important than the sutras, Chinese koan collections, and other Buddhist writings. The most enthusiastic responses came from outside of the community of his students. Today there are other collections of his lectures, a couple of books about him and his teaching, more books and articles with something on him or from him, and much more on the Internet, including all his extant lectures. There are more than seventy groups in his lineage scattered around America and Europe. 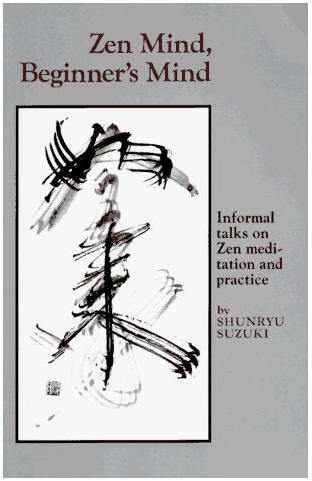 But Shunryu Suzuki’s renown as a seminal spiritual teacher is almost entirely due to this one unique volume. Books by and about Shunryu Suzuki. Dharma groups in Suzuki's lineage or related. Also look at the main links section of cuke.com. In 2004 Weatherhill, which originally published Zen Mind, Beginner’s Mind, became an imprint of Shambhala. Now in 2010 with this special edition, Shambhala commemorates the fortieth anniversary of the publishing of these celebrated “Informal Talks on Zen Meditation and Practice.” Shambhala Publications link and Amazon link to the 40th anniversary issue of ZMBM. More significant than Zen Mind, Beginner’s Mind’s consistently impressive sales is its universal appeal. It easily moved past the perimeter of Buddhism into libraries, university classes, and reading groups. It now shows up on almost any list of modern spiritual classics in the West. Laurance Rockefeller said he kept it by his bed. Film director Sam Peckinpah opened it one evening and didn’t put it down all night. Basketball coach Phil Jackson refers to it repeatedly in his book, Sacred Hoops. Its influence did not diminish with time. In 2000, Tosca, the Viennese “masters of deluxe soundscapes,” released Suzuki, an album dedicated to Shunryu Suzuki. I’ve seen quotes from it on greeting cards, on the side of a soy milk container. Laurance Rockefeller - Major donor to the SFZC. Steve Jobs' favorite spiritual book was Zen Mind, Beginner's Mind but he never met Suzuki. He did though have a close relationship with Kobun Chino Roshi. Zen Mind, Beginner’s Mind had a fresh, early morning quality to it. Suzuki Roshi spoke with a spare voice, unpretentious and humorous. It was, in fact, an American Buddhist voice, unlike any heard before, and yet utterly familiar. When Suzuki Roshi spoke, it was as if American Buddhists could hear themselves perhaps for the first time. I emailed Kaz and said that he'd told me that ZMBM was Dogen for Americans and asked if I could quote him and he emailed this clarification back. A year ago, for the fiftieth anniversary of Suzuki’s arrival in America, Genine created an exhibition in which each page of the book was represented by someone’s contribution, culled from hundreds sent her, including pages translated into Czech, Dutch, Finnish, French, German, Icelandic, Japanese, Portuguese, Russian, Spanish, and Vietnamese. We’re not sure how many languages it’s been translated into. Genine says there’s a student at the City Center who read it in his native Mongolian translated from the Russian version. Genine Lentine has a very cool site. Check out her books. This site does not include The Page Project in the project section. She is now (fall 2010) the artist in residence at the SFZC's City Center. Indeed, Robert Boni’s photo on the back cover is a key ingredient. It resides on many a wall and refrigerator. Tibetan Rinpoche, Chogyam Trungpa, who called Suzuki his accidental American father, placed that photo on his group’s altars along with that of his own teacher. Mrs. Suzuki, however, didn’t approve of it, at least when she first saw it, and wondered aloud why a formal photo of her husband in ceremonial robes hadn’t been used instead of one taken when he was in his work clothes and needed a shave. The Estonian poet Jaan Kaplinski refers to this photograph in a poem called “Shunryu Suzuki,” translated into English with Sam Hamill. Interviews and more with Mitsu Suzuki, Shunryu's widow (96 and doing well back in Japan as of this writing in October 2010). Should have introduced who Richard Baker is here though we learn later in article. 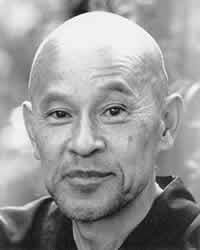 He's Shunryu Suzuki's sole American direct dharma heir, abbot of the SFZC following Suzuki, founder of Dharma Sangha in America and Germany.. In my introduction to Zen Mind, Beginner's Mind I allude to my experience with Suzuki Roshi. Any way to be affiliated with Suzuki Roshi is a joy as you understand. I wish I had more to add but I remember nothing but the wonderful aura, the peace and presentness of the man, his impact upon me. His contribution was immense. Of the two Suzukis, Daisetsu accomplished a major major achievement by bringing Zen and, in a way, Mahayana Buddhism to America, not single-handedly, because there was Nyogen Senzaki in LA, and the 1st Zen Institute in New York City with Mary Farkas, but as far as the general public was concerned, almost that. And then Shunryu Suzuki comes in in a different mode, because far from the public figure that Daisetsu was, Shunryu was quiet, low key, low profile. And I do think that the two Suzukis had the most impact. I think of them as complementing each other in a very wonderful way. Huston’s comparison reminds me of how once on a bus in New York City when someone asked him if he was D.T. Suzuki, Shunryu replied that no, he’s the big Suzuki, I’m the little one "He’s the big Suzuki, I’m the little one." See Remarks on ZMBM at Forty from Victor Sergeyev (with DC responses). He found two sources, the source surely the one on the bus with Lolly Rossett communicating between Suzuki and another passager. What caught my attention was the combination of person, voice, and perspective. The person looked at me from the back cover as if challenging my assumptions about Zen and reality in general. His voice on the page had a unique way of expressing key ideas and explaining the commonplace so that it took on new significance. Zen was not restricted to meditation but permeated all dimensions of life and consciousness. To a young man like myself in Kansas who was sorely disillusioned by Vietnam, race and cultural conflicts, and Watergate, the book offered an entirely new perspective on reality and human behavior. This quote from John Nelson sent to me via email. For all the genius of its cultural and canonical translation, the practical wisdom of this book arises from its communal creation, bred by teacher and students listening and talking to each other in the course of sitting, walking, and working together every day. Through the dance of this dialogue, embodied in a way of life reborn over eons and expressed with poetic grace, comes a truly original and compassionate voice so close at hand it can open our eyes and touch our hearts. Steve Tipton and his books are mentioned many times on cuke.com. He's a close advisor and good friend. cuke interview with Steve Tipton. It includes at least one story that's in Crooked Cucumber. Buddhism had long been established within Asian-American communities when Suzuki arrived in San Francisco to serve as the priest for Japanese Americans at Sokoji, the city’s Soto Zen temple. But only a handful of people in the West such as poet Gary Snyder had worked with a teacher and grown deeply involved with zazen. At the same time, Buddhism had been moving gradually from something lofty to admire from afar into something practical that one could integrate into one’s life. The Light of Asia, a biography of Buddha published in London in 1879, had sold over a million copies and been made into a movie in 1928. D.T. Suzuki’s and Alan Watt’s brilliant books on Zen and Buddhism were widely read. Dwight Goddard’s A Buddhist Bible inspired Jack Kerouac, and Kerouac and his Beat colleagues inspired many others. Indispensable sutras, early Buddhist texts, and commentary on them became available through scholars such as Edward Conze. Paul Reps and Nyogen Senzaki’s Zen Flesh, Zen Bones was a delight. Such skillful and devoted writing over decades had set the stage for what was to follow--people diving with body and mind into the stream of Buddhism. "Buddhism had long been established within Asian-American communities" - see How the Swans Came to the Lake and this Wikipedia article. The film based on The Light of Asia, Prem Sanyas. Dwight Goddard - A Buddhist Bible in the San Jose Library. Zen Mind, Beginner’s Mind begins with Suzuki saying that the goal of practice is always to keep our beginner’s mind. Limitless and ready for anything, this Eastern tabula rasa is not, however, a blank starting point. It is the point. This is the “mind of purity open to things as they are” or “things as it is” as he sometimes said. Suzuki’s first teacher, Gyokujun So-on, stressed the importance of beginner’s mind. So had Dogen. I’m reminded of the well-known D. T. Suzuki story of the Zen master who poured tea to overflowing the cup of a visiting professor to illustrate that his guest’s mind was so full of assumptions and opinions that there was no room to learn anything. And then there was the wealthy lay sage, Vimalakirti, who had his home emptied of all furnishings in order to truly receive Shakyamuni Buddha’s visit. Beginner’s mind is the key to awakening to big mind, a favorite term of Suzuki’s – big mind, the absolute, our true nature; not small mind, the product of our “silly idea of self.” One of Shunryu Suzuki’s closest disciples, Silas Hoadley, remembers Suzuki saying in the early sixties, “I’ve come to destroy your mind.” Silas realized that the mind targeted for annihilation was the ego, the small mind, a delusion to begin with, but he said it was still a chilling statement. Suzuki recalled how he and his fellow disciples were losing their beginner’s mind in their teens – through innocently seeing Zen as good, special, a means to gain something. He warned about the perils of being attached to any idea, including that of beginner’s mind. Beginner's Mind excerpt from ZMBM, the Prologue, with a link to the original. - See Remarks on ZMBM at Forty from Victor Sergeyev (with DC responses). Beginner's Mind - Chapter One for a book of the same name, from Marian Derby's original manuscript. See Haiku Zendo Chronicles part 1.and part 2 for more on Marian, Suzuki, and Kobun Chino. We also have Marian’s father to thank for asking a question while driving Suzuki from Los Altos to San Francisco. He asked what his personal ambition in life was, and Suzuki, surely because he was not talking to a student of his, said, "I'd like to write a book." When her father passed this on to Marian, she took it seriously. She talked to Suzuki about taping his lectures and putting together a book. He agreed. At about the same time his students in San Francisco likewise began to tape. Of what he said before that time we have some 30 lectures, many just fragments, based on notes. But from July of 1965 to his final season late in 1971, we now have about 330 complete lecture transcripts with the audio as well for all but sixty. We’re still finding tapes and transcripts not included in the known archive of his talks. Sadly, all but two of the tapes for the Zen Mind, Beginner’s Mind lectures are lost. This first sentence is wrong. The exchange between Suzuki and Marian's father was in 1966 after she'd been taping. However it did lead to her talking to Suzuki about putting some of the material together for a book. See Crooked Cucumber on this which I should have referred to rather than writing from memory. Although this book contains the earliest of Suzuki’s captured talks, they hold up well in comparison to those that followed. Joseph Galewsky, a Zen practitioner and professor of Earth and Planetary Sciences at the University of New Mexico, has studied and worked with the Suzuki lecture archive. He remarked that these mid-sixties talks from Los Altos, which Suzuki knew were being recorded for a book, are to him the most clear and concise of them all, “with that warm, wise way of talking about the Dharma that has become the hallmark of Suzuki Roshi's teaching.” Joseph Galewsky - who also runs the Desert Mirror Zendo with his wife, Deborah Russell. See Remarks on ZMBM at Forty from Victor Sergeyev (with DC responses) clarifying use of the word "captured" -- and then more on how there's no evidence that Suzuki knew there was any idea of a book for many of the lectures he gave that are in it. See Remarks on ZMBM at Forty from Victor Sergeyev (with DC responses) where Victor asks why this account differs from that in Crooked Cucumber which does seem to follow the evidence more closely - and also where he questions the use of the term "team" - and more. In 2000 Weatherhill brought out a new edition and, as with the first one, made little of it. Richard Baker who became Suzuki’s sole dharma heir in America and literary executor of this book, corrected a few misunderstandings from his introduction. There were a couple of mistakes in the chapters, too, one being that Suzuki had, with customary absentmindedness, attributed the Sun-faced Buddha, Moon-faced Buddha story to Ummon (Yunmen) rather than Baso (Mazu) – and no one caught it in time or did anything about it for thirty years. I understand that the Japanese translator took Suzuki to task for that in his introduction. It hasn't done well in Japanese. He's been regarded by the Soto Zen establishment in Japan as overrated in the West, possibly because he acted on his own, not within or through their system of which he was quite critical. Richard Baker is literary executor of this book and only this book as per Shunryu's answer to Baker when specifically asked whether he was to be executor for all of Suzuki's lectures etc or just this book. Other mistakes that were fixed as a result of communication between DC and Baker: Suzuki came to US in 1959 (not 58) at the age of 55 (not 54). He did not lead a peace movement in Japan during WWII. Now the introduction has a more nuanced statement. +Need to get statement from old intro and new intro. See much on all this at Shunryu Suzuki and others on Peace & War. I distinctly remember there being two mistakes in the text. There's the Baso to Ummon one, but right now no one can remember what the other one was or if there were other changes. I guess I have to have someone read the whole new edition to me while I look at the old one to figure out what the other change(s) is/are. That wouldn't be so bad. +include more about Japanese priests not being so impressed with Suzuki and just thinking that Americans have been wowed by his foreign-ness or something. And of course there are Westerners who feel that way too. After all this is religion and people have different approaches and have "en" or "goen," a connection, chemistry, karmic tie with different teachers and teachings. Fred Harriman, a brilliant translator I’ve worked with, whom I regard as an expert on things Japanese, says that in time they will inevitably come to recognize Shunryu Suzuki in his homeland, because he did something very important to them - he brought something completely Japanese to the West and successfully planted it here. Fred Harriman on Shunryu Suzuki's family in Japan. As Maezumi pointed out, we don’t really know what happened in the past, but as I see it, a team of people heeded their highest angels to create this book. Marian came up with a manuscript entitled “Beginner’s Mind” in which she had minimally edited most of the lectures she’d recorded. Suzuki suggested she pass the manuscript on to Richard so he could edit it. She gave it to him in March of 1967 just as Tassajara was preparing for the first practice period. When he finally read it the following fall, he agreed it was good material for a book—after more work. He worked with it awhile, but he was busy with the growing Zen Center and its fundraising efforts and turned for help to Trudy Dixon, a Wellesley graduate who’d also done graduate studies in philosophy at UC Berkeley. She agreed, even though she was married with two young children and was dealing with breast cancer. The result was a close collaboration. Trudy and Richard would each meet with Suzuki to clarify what he meant in particular passages, and they would also meet together to discuss how best to express his meaning. Trudy devoted the last working energy of her life to this book - honing the language, organizing the talks into three sections and deciding on the quotation headings. As she was dying she continued to sit zazen, until it became reclining zazen, and finally lying down zazen. She is remembered for her intelligence, spirit, and courage. Thanks to Mike Dixon for going over all this with me recently and also for drawing the fly on page 69 of ZMBM. He drew a new one for the new edition in 2000 because the original art was lost I guess. Mike Willard Dixon's website - he uses Willard Dixon for his artist signature. See Remarks on ZMBM at Forty from Victor Sergeyev (with DC responses) where I agree should not write "Beginner's Mind" contained "most" of the transcripts. Should be "some." See Remarks on ZMBM at Forty from Victor Sergeyev (with DC responses) - more on who did what when. ZMBM in Crooked Cucumber includes more about Trudy Dixon including Suzuki's emotional talk given at her funeral. In October of 1968, at Suzuki’s request, Baker sailed for Japan to further study Zen and the culture it was wrapped in. He went with his wife and daughter, and the nearly completed manuscript. In Tokyo he would find the publisher. See Remarks on ZMBM at Forty from Victor Sergeyev (with DC responses) - more on who did what when. Before me is the unedited transcript of a lecture that Suzuki gave in November of 1965. A sentence in it reads, “In beginner's mind we have many possibilities, but in expert mind there is not much possibility.” In the book, through various stages of editing, that became the often quoted, "In the beginner's mind there are many possibilities, but in the expert's there are few." The message is unchanged but it reads better. Beginner's Mind excerpt from ZMBM, the Prologue, with a link to the original. A Response to the April 2012 appeal for funds for the Cucumber Project and comment on Zen Mind, Beginner's Mind from the Curmudgeon Buddhist. 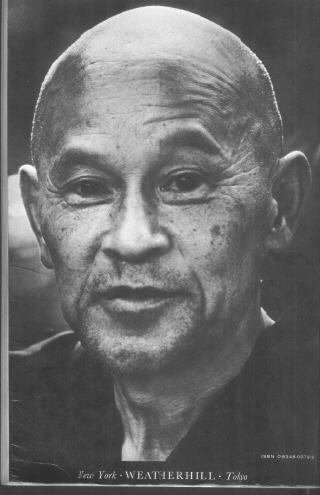 "I read Zen Mind, Beginner's Mind,” Suzuki said once, “to see what the understanding of my disciples is." “to see what the understanding of my disciples is." - I just remember him saying this from way back. I think someone told me - maybe Peter Schneider. Interview with Peter and Jane Schneider. Peter was asked to edit ZMBM before Trudy but he was too busy being director of Tassajara. Here's the spot in that interview where Peter quotes SR.
See Remarks on ZMBM at Forty from Victor Sergeyev (with DC responses) wherein Victor shows that in a quote from Peter almost identical to this, Peter is refering to his own opinion - something he said, not Suzuki. I remembered it wrong and didn't remember where it came from. Now I see it as a mistake. It's also in Chapter 17 of Crooked Cucumber. I'll add this to the Errata section of that book. It should be cut from this Afterword. "It’s interesting for me to look at Zen Mind, Beginner's Mind to see how students understood him." Suzuki Roshi said it wasn’t his book. He said "It’s interesting for me to look at Zen Mind, Beginner's Mind to see how students understand me." The former is just a mistake either in how Peter said it or in transcribing. The sentence moves from a present tense quote in first person to a past tense third person reference of Suzuki. On that day when the books arrived, Suzuki looked one over, made light of it, hung out awhile, and went with his wife back upstairs to their rooms. Again, I was there and that's how I remember it. This is where the published version ends. My agent, Michael Katz suggested it end here without the... must find his not... drama or whatever of the subsequent lines. I informed the Shambhala editorial assistant James Rudnickas of this and left it up to him or them - maybe Peter Turner, the president and whom I think of as the senior editor, had a say. I didn't know they'd taken Michael's suggestion till I got the book. The ending lines that were cut follow in black type. Not long before he died a year and a half later, he said, "I've put my cookies in the oven, they've come out fine, and now I'm going to crawl in." "I've put my cookies in the oven," Bill Kwong told me Suzuki said this to him on their last visit. See interview with Bill Kwong and link to Genjoji, Sonoma Mt. Zen Center (just a ridge over from where DC lives). He’s crawled in, burned up, and gone, but his life work lives on in his students, in the ever-increasing exchange between East and West, in his lectures, in the flow of paradox that is Zen Mind, Beginner’s Mind, in flesh, in spirit, in word, passing the teaching on, as he said, “warm hand to warm hand.”+“warm hand to warm hand.” - Don't know if there's a source for this. Maybe in lecture, maybe not. And after forty years this book, to paraphrase a friend, still has its beginner’s mind. "still has its beginner’s mind." - Someone in the office of the City Center said this to me when I was interviewing people for ZMBM at Thirty-eight and Counting, an article I did for Inquiring Mind for their Dharma Treasure series. I don't remember who. It was a guy. David Chadwick is the author of Crooked Cucumber: the Life and Zen Teaching of Shunryu Suzuki, (Broadway, 1999) and Zen Is Right Here: Teaching Stories and Anecdotes of Shunryu Suzuki, Author of Zen Mind, Beginner’s Mind (Shambhala Publications, 2007). Sources for the quotes in this article, notes, and extensive elaboration can be found at www.zmbm.net. That's right. And this is the next to last elaboration. “Shunryu Suzuki” is reprinted from Wandering Border (1987) by permission of Copper Canyon Press. This permission isn't mentioned in the article but at the front of the book on the copyright info page.